Despite the fact that Disneynature’s upcoming documentary African Cats doesn’t open for almost two weeks, fans have already purchased $1.7 million worth of tickets via the “African Cats, Save the Savanna” initiative. Moviegoers who purchase advance tickets are helping to save the Savanna via Disneynature’s program, and the advance tickets already purchased translates into more than 9,500 acres saved within Kenya’s Amboseli Wildlife Corridor. With how ticket sales are advancing so far, that number will only continue to rise as we get closer to the film’s opening week. We are very impressed with the passion people are showing for African Cats – advance ticket sales for this film have surpasses both Earth and Oceans at this stage of the game, which shows how excited moviegoers are for both the movie and the Save the Savanna initiative. African Cats will open April 22, 2012. 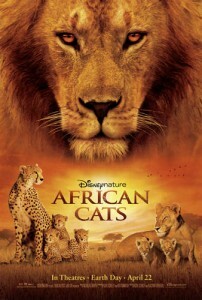 If you’d like to purchase tickets, they are available via disney.com/africancats.